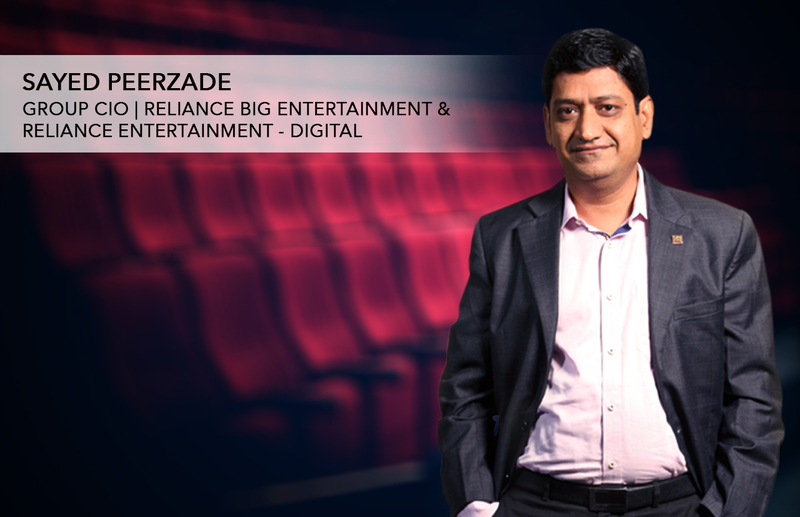 While traditional form of content distribution may not die, OTT has become the new ball game, says Sayed Peerzade, Group CIO, Reliance Big Entertainment & Reliance Entertainment – Digital. The media and entertainment industry was one of the earliest sectors forced to adapt to digital disruption and innovate in terms of products, content and distribution channels. While traditional ways of content distribution may not die, Over the Top (OTT) channels will determine the future of this industry, says Sayed Peerzade, Group CIO, Reliance Big Entertainment & Reliance Entertainment-Digital. In this exclusive interaction he also shares how being an early adopter of cloud and digital technologies helped Reliance gain cost and competitive advantages. How easy or tough was your digital transformation journey? What were the challenges and the learnings? Transformation was both easy and tough for me. Easy because my organisation backed me on the digital business roadmap and empowered me to consolidate various digital businesses that were growing in isolation. It was also tough, because the target given was not just consolidation of technical setups and team. It involved building a platform for growth, better time to market and, more importantly, bring down costs to a manageable level. At that time all functions and teams worked in isolation. Different businesses were formed for different purposes and were catering to different user communities. Applications and products were built on entirely different technologies and hosted on different environments. Consolidating them on to one single platform with all other specified requirements was a tough task. This was when I started thinking of innovations and bringing in digital technologies to the battleground. This is how my cloud journey started. While people were still talking about cloud technologies in most tech forums, I designed the roadmap for a private cloud with a virtualised environment, tested all the applications in a planned way, migrated the entire multiple DC setups to a single private cloud environment. We struck an innovative deal with a startup offering DC services, and got them to invest in new hardware that suited our requirements. We went into an out and out OPEX deal, which later came to be known as IAAS in the industry. This taught me that risk taking, intense planning, knowledge, ability to execute, a good and well mentored team are a must for any CIO to bring about positive changes in an organisation. You have a portfolio that extends across film, TV, web, and gaming. How are you mining customer insights and translating them to better customer experience? For my business, which is primarily B2C, content quality and customer experience is directly proportional to revenues. One of the primary objectives of bringing about digital transformation is consumer experience. Since we have a range of digital businesses, with an almost 100 million user base across globe, getting user insights on all products is of prime importance. This is where analytics helps. We brought analytics into the picture long back. It’s the same story as our cloud adoption. We designed an end-to-end analytical solution at a very early stage compared to the market. This platform does everything, starting from collection of events data from each session of a game to analysis, so that business can take a data-driven decision made around customer insights. Now we have upgraded that solution for live analytics. We have also redesigned the completely native cloud platform for data analytics and it collects 65 million events per day and churns out around 17PB of data. We can immediately see what’s going on in the product and with the user base to take appropriate decisions. What’s your take on cloud adoption? Do you see hybrid cloud as the only choice in the foreseeable future? We have reaped tremendous business benefits by transitioning to the cloud. We reduced server foot prints by 70 per cent and this resulted in a 70 per cent reduction of operating costs. Our digital business started flourishing. Our biggest achievement was when we started a new venture, Reliance Games, by investing the huge savings we had from this transformation. It also helped improve time-to-market for products, improved user experience and brought in great flexibility and agility to the business. We started our journey with private cloud, then added public cloud for a new venture we launched as we need to be near users. This makes it a perfect hybrid setup. However, hybrid cloud is not the only choice. It varies from business to business. But, as of today, hybrid is the best strategy for enterprises. My experience tells me that public cloud, specially for large volume businesses, is not cost effective in the long run. Considering that your data protection strategy revolves around how you adapt to cloud technologies, hybrid cloud is the best option in most cases. Technologies like AI, ML, and NLP have the potential to transform the way enterprises engage their customers. How are you experimenting with these? Although we build large data driven analytical ecosystems for all sorts of actions and corrections in the areas of product and user experience, there still exists the need for accuracy and speed. There is a need to automate actions, get more granular insights and train the system based on data patterns. To achieve this objective, ML and AI techniques are being adopted. We have built large algorithms around our data systems and are training them to adapt. The objective is to make the system perform at its best without manual intervention. Our focus here is on user retention, which will yield more revenues. We are working big time on AI at present. AI is a transformational technology that if implemented in the right manner will definitely yield results. My advice to those evaluating AI and ML—first build a robust ecosystem and if you have huge volumes of data, then bring AI into the picture. This is because AI works better with huge volumes of data. I have experienced that training of systems is a continuous process. You can’t just leave it after building initial training patterns. There should be constant analysis of data. You should build use cases and algorithms around them and keep training the data. I would say it’s a never ending journey. Give us an idea of how entertainment will be distributed and consumed in a digitally transformed world. With the explosion of mobile devices across globe, and internet penetration getting better and better every day, the entertainment industry is witnessing huge disruptions. One trend is that the screen is moving closer to the user. User acquisition, engagement and retention are key parts of business. At the same time, business disruptions are leading to innovations and that’s why digital transformation is a must for the media industry. Traditional ways of entertainment like theatres will not die, however with digital you can reach a larger audience. This has brought a good change in industry. In the bid to reach out to more users, better content is getting created. Content is specially getting curated for digital viewing. Traditional TV is adapting to the digital way of transmission of content over the internet. OTT has become the new ball game.